Pork is an important part of any menu. We partner with the best regional and national packers to feature delicious, humanely raised choices. 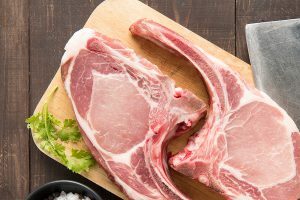 Baby Back Ribs, Tenderloins, and Porterhouse Chops in the summer, Braised Shanks and Frenched Rib Chops in the winter, pork is a cost favorable component diners look forward to ordering. We can fabricate custom cuts to the chef’s direction: cheek medallions, boneless hog side for Porchetta, 2 bone chops, boneless leg for roasting – the choices are as many as they are delicious. Columbia Empire produces a delicious line of both country style and Italian sausage. We can also custom blend sausage to your recipe, either in links or bulk ground. Let us work up a recipe for your next menu. On the all-important bacon front, we offer Daily’s, Hill’s, Carlton Farms, and Sunnyvalley Farms, so we are sure to have the bacon you might need for any occasion.